Master with the Tailor Crafting Guild. Rank 6 (45386) in the Ettenmoors, with 254 Killing Blows. Hailing from the Blue Mountains of Ered Luin, Mule, Guardian of Strayhold lifts his axe high to fellow kinmates. With a proud demeanor , Mule pronounces his services in both battle and craft, promising to put his services to the betterment of the kin. While still holding a lust for all things gold, Mule's lust for loot and booty is only superceded by his lust for battle. 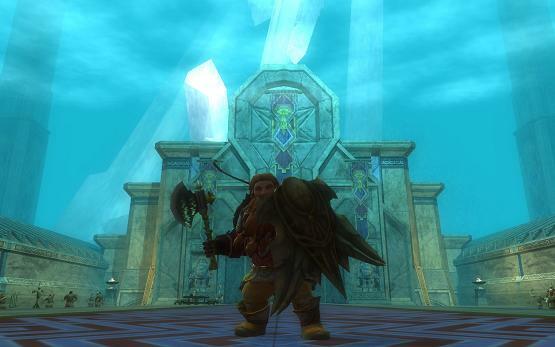 Rumor has it this dwarf had spent day and night in the depths of Sarnur slaying troll after troll. When his bags were full, he continued his slaying of the trolls, leaving loot to the ghosts. When not slaying evil and fancying items, Mule enjoys pints of ale at the Prancing Pony. Be wary though friend, while Mule's stories of heroism may seem far-fetched, a wrong step may result in his legendary axe residing upon your throat and his jolly-face-turned-grimace staring down at you exclaiming "What business have you with me?"